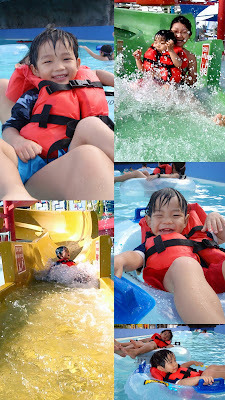 Now, this is really wayyyy long overdue... During my birthday earlier this month, Daddy & Mummy brought di-di & me to Wild Wild Wet At Downtown East for some splashing good fun! It was the first time there for us... and it was like 1 giant playground, only that we got to be wet as well! Yah lor... I'm always like that; need time to warm up first. We also went on this water channel ride, where we got to rest our bottoms on these giant floats and let the water currents sweep us round the water park.